Theresa, attended the AZ Institute of Micro-pigmentation and is a member of the Academy of Micro-pigmentation. Her attention to detail & caring nature, sets her apart with her clients.Theresa has furthered her education, to become an expert in corrective color, and shape. She uses only the best pigments by using a German made equipment patented disposable cartridge system, that prevents cross-contamination. 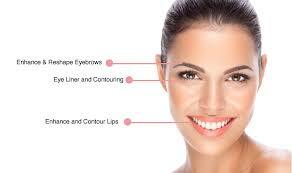 Permanent makeup is cosmetic tattooing. The specialized techniques used for permanent cosmetics are often referred to as, “micro-pigmentation”, and “micro-pigment implantation”. The cosmetic implantation technique deposits colored pigment into the upper reticular layer of the dermis. Permanent cosmetics procedures are performed using various devices, including the traditional tattoo coil machines, the pen or rotary machine and the non-machine or hand device. The process includes a consultation, the application of pigment, and at least one or more follow up visits for evaluating the healed design work and color of the pigment. Who is a good candidate for Permanent Make-up? People who meet minimum age requirements and have the ability to heal properly from minor wounds, can benefit from the liberating benefits of permanent cosmetics. Permanent Cosmetics can benefit all different types of skin and age ranges for those who desire a soft, natural enhancement to their appearance. It is a valuable service for people who can’t wear traditional cosmetics, due to allergies or skin sensitivities. Also active people, who want to look their best for sports activities, such as swimming, hiking, biking, tennis, aerobics, also to those who don’t want to worry about “sweating off” or reapplying cosmetics. Permanent Cosmetics also benefits the visually challenged, who have difficulty applying their cosmetics, and other related conditions, such as arthritis, Parkinson’s disease, multiple sclerosis, stroke survivors, and busy people who don’t have time to spend applying and refreshing makeup throughout the day and evening. We use 100% USA-made pure pigments ONLY! Eye Liner (upper or lower). Corrective Shape or Color requires consultation. Removal & Scar Camouflage requires consultation. Join our Newsletter! We have "Specials" every month, don't miss out! The Forever Young Aesthetics Newsletter is filled with “ageless beauty” skin care techniques and monthly specials on our services & skin care products!